Coming from the Princess of Acadia ferry from Saint John, New Brunswick, Drive Shore Rd until you reach the second stop sign at the top of the hill, turn right at the four-way stop and drive down Digby Neck until you see the sign for Whale Cove.Turn right on Whale Cove Rd and Whale Cove Campground is at top of hill. Coming from Yarmouth towards Digby, take Middle Cross Road to access Highway 217. Turn left at stop sign and drive down Digby Neck until you see the sign for Whale Cove. Coming from Halifax, take exit 26, turn right at stop sign and turn left at the second set of traffic lights.Turn left at the four way stop and drive down the Digby Neck until you see the Whale Cove Sign. 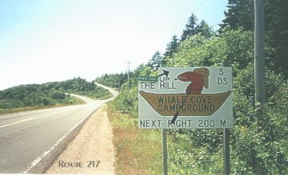 Turn right on Whale Cove Rd and Whale Cove Campground is at top of hill. This is the last sign before you turn right to travel to top of hill to the Campground.